So I am working on (and will be sharing) word posters to help with memorization. Here's is number SIX. 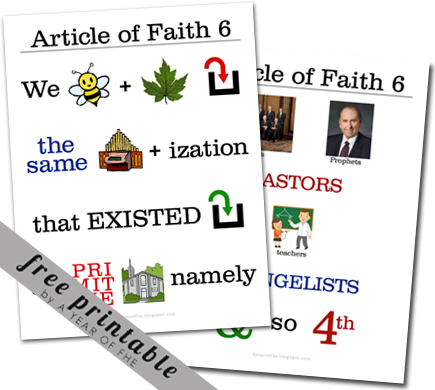 To see all available Article of Faith posters CLICK HERE. *IMPORTANT NOTE: The church handbook prohibits use of pictograms like these for memorization in church. These should be used for HOME USE ONLY. For more information click here. Yeah! I'm so excited! Thanks for sharing! I love your site I just found it a couple weeks ago but it has all ready been such a blessing! Thank you so much!! I downloaded all the other ones you have made too. You are so incredibly talented. I love your blog sssooo much!!! Thanks again. Hey these posters are way awesome but I read your Note that we shouldn't be using them for memorization in church?! What about for the little kids learning to sing the articles of faith? Would that be okay, and if it isn't I would like to know where in the handbook it says not to use them? Just trying to find out more about it. Thanks! The church doesn't prohibit. My Stake leaders loved the ones we designed some years ago and still use them! Anonymous - Your Stake Leaders must have not read the handbook thoroughly. It is clearly and distinctly written that these are prohibited for church use. Believe, me, I wish it wasn't, but it is. Do you know where in the handbook it states that? I can' t find it anywhere. Sorry I am confused because if you read The Friend, they use pictograms all the time. You have made my DAY!!! I got on your link today just to find these. My 4 year old son used them to learn the first 5 you posted. It was a HUGE help and he now can say them memorized and feels SO special by passing them off on his own. Life got crazy and I never took the time to come up with some of my own. When I got on today and saw you released 6 & 7 it made my day, week, month!!! Your talents are amazing and I'm grateful you share them with us. PLEASE keep them coming!!!! I am having trouble opening this one to print but all the others work great is there something that needs to be adjusted? These are great thanks so much!!!! Is it possible to update the picture of the Prophet?